Will You Be Our Valentines? We think that you’re fabulous. We appreciate your positive attitude, your willingness to help out in anyway that you can, and your desire to learn and share your expertise. We love your commitment, your sense of humor and your compassion. Our hearts pound with joy when we think of how smart and dedicated you are, and how you share time, talent and grace under tremendous pressure. We see how wonderful you are and we know that what you give to the Red Cross and the people we serve means more than we could ever write on a card. Thank you for everything that you do, for everything that you are, and for your friendship and support. So, will you be our valentines? 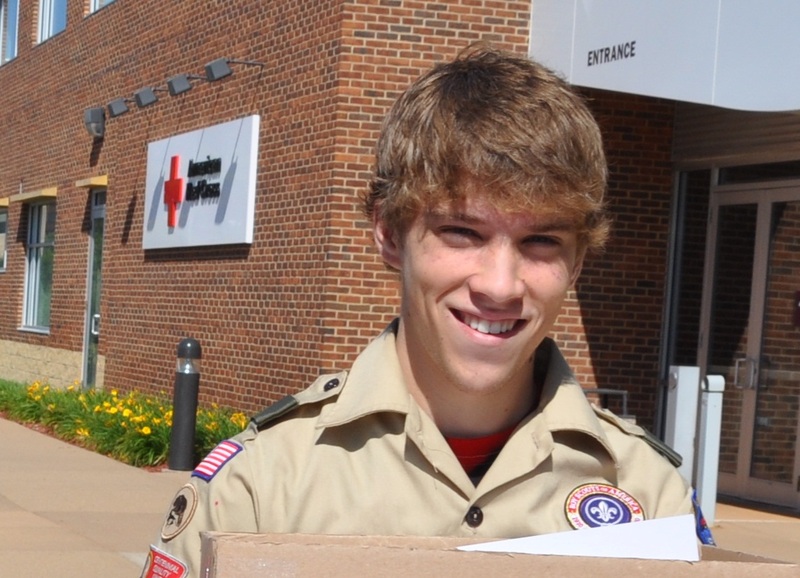 So, the other day, this young man named Paul van Vliet stops by Red Cross offices in Minneapolis and drops off comfort kits for kids. How cool is that? He (Paul) comes up with his own project idea (making comfort kits for kids) and provides them (the kits) to us (Red Cross) so that our disaster relief workers can give the kits to kids affected by disasters (like fires, floods, & tornadoes). Now, let’s give some credit to us (Red Cross) because we came up with the original comfort kits for adults and children idea, but we rely on motivated and generous peeps like Paul to make this kits and help reduce the suffering of people who escape burning buildings or high waters. Paul’s dad John was on hand for the comfort kits for kids drop off. He took a fine photo of his son Paul (top & bottom) and then sent us a nice note (excerpt below left). Well, John, we think your son is the bee’s knees. We could not do what we do without him and others like him. We wish Paul many happy days during his next adventure (college) and hope that he will make his way around the world and back to us some time in the future. 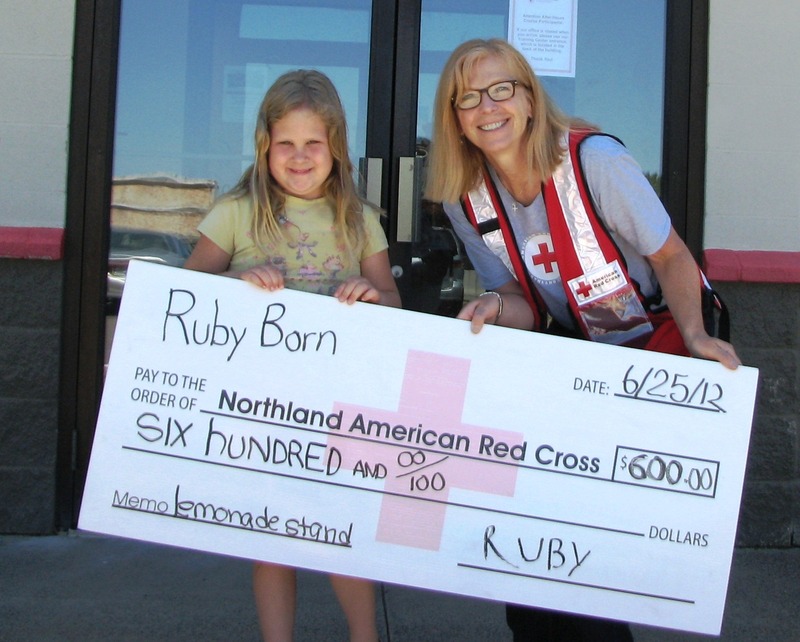 When Ruby Born, 6, came to the Red Cross office in Duluth, Minnesota, after the flash flooding, she had a sparkly yellow skirt, a beautiful smile, and a plastic bag filled with cash for the American Red Cross disaster relief operation helping affected families. “We sold lemonade,” she told the Red Cross. Ruby held a two-day lemonade stand in her Superior, Wisconsin, neighborhood (just across a bridge from Duluth), selling an estimated 60 cups of lemonade. Her parents Jeanne and Hector matched Ruby’s $150 in sales. And Enbridge Energy in Superior matched their combined gift for a total contribution of $600.00. The Red Cross continues to respond to flash flooding that resulted after a storm dumped more than 9 inches of rain across northeastern Minnesota and northwestern Wisconsin, causing widespread damage and displacing hundreds of people. The Red Cross supported around 200 people in shelters. 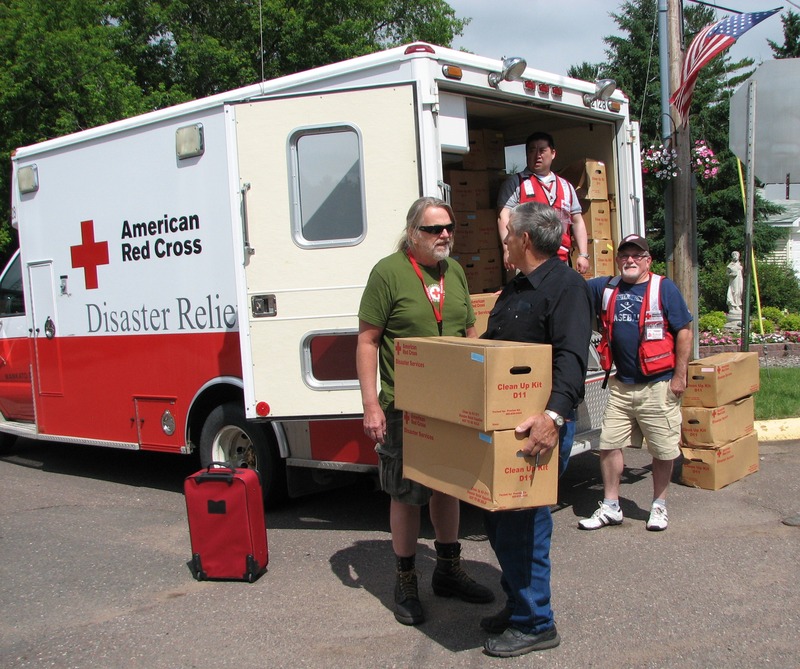 Red Cross disaster relief workers conducted damage assessment across several counties in Minnesota and Wisconsin. Other Red Cross workers are still on the ground distributing water, food, and cleaning supplies to people in the most impacted areas. 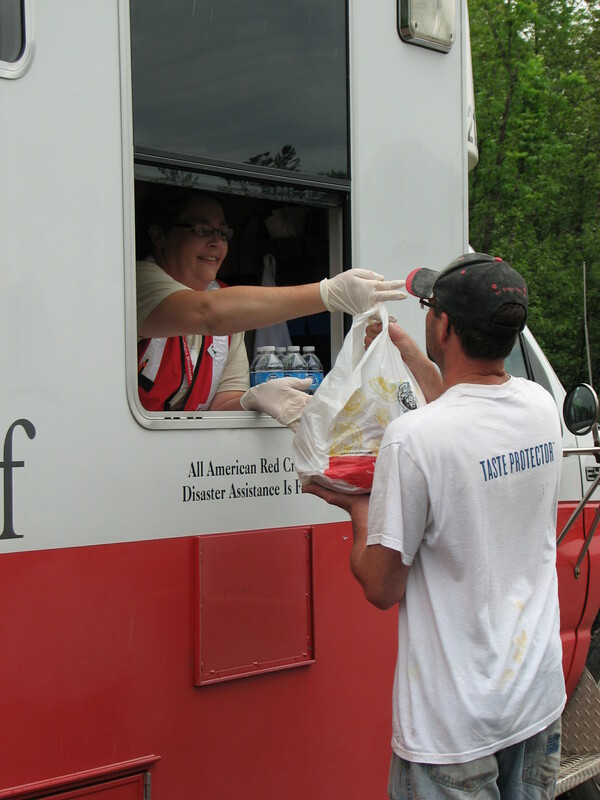 Red Cross disaster relief workers provide food from mobile trucks, Fond du Lac, Minnesota. Photo credit: Judy Hanne-Gonzalez/American Red Cross. Thank you Ruby, and to everyone, for supporting the American Red Cross and helping fulfill our mission to reduce human suffering in the face of emergencies. Every dollar counts, including those made from selling lemonade. 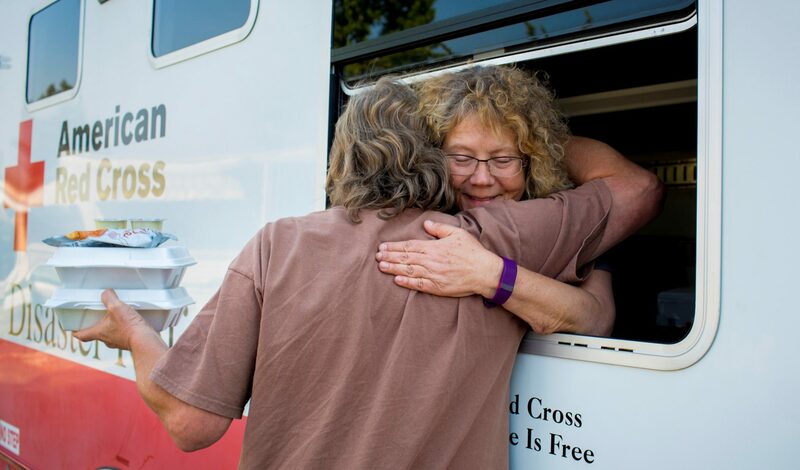 If you would like to help people affected by the Northland flooding and other disasters here and around the world, you can make a donation to support American Red Cross Disaster Relief by visiting redcross.org, calling 1-800-RED-CROSS (1-800-733-2767) or texting the word REDCROSS to 90999 to make a $10 donation. Contributions may also be sent to your local Red Cross chapter or to the American Red Cross P.O. Box 37423, Washington, DC 20013. You’ve heard the news or seen the images of the dramatic and traumatic events that continue to unfold in northeast Minnesota. We want you to know that the Red Cross is going full force–ramping up each moment–to help the people who are affected by this disaster. Last night we supported 185 people in shelters across the region. We offer, here, a couple portraits of people who are affected by this disaster. Portraits and Photos from Judy Hanne-Gonzalez, Executive Director, American Red Cross Northland and North Star Chapters. Michelle Henry, Charles Goggleye, and their children Koda Duane, five years old, and Jayden, two years, were staying with a sister in the Fond du Lac neighborhood when they were evacuated mid-morning on Wednesday by police as flood waters quickly rose. They escaped in their car, but it quickly broke down leaving them stranded again. They called Charles’ mother only to find that his brother and five children had also been evacuated and were staying there. So they found transportation to the Copper Top Church, where Red Cross workers were providing food, blankets, and a warm dry place to stay. Red Cross volunteers entertained the children with movies. “We love the Red Cross,” says Koda. “They’re really nice!” Jayden and Koda loved the Red Cross comfort kits they were given, which included crayons, coloring books and toothbrushes. The kids rushed to open the new toothbrushes and practiced brushing their teeth. 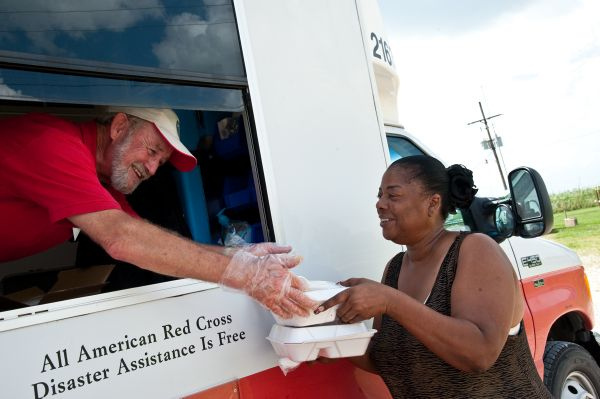 The Red Cross will soon begin mobile feeding as impacted areas become accessible; damage assessment volunteers are gathering and will deploy within 24 hours. Perhaps you’re already helping in some way, but if you’re wondering about HOW YOU CAN HELP, you can make a donation to support American Red Cross Disaster Relief. This gift enables the Red Cross to prepare for and provide shelter, food, emotional support and other assistance in response to this and other disasters here and abroad. Visit www.redcross.org or call 1-800-RED-CROSS. Contributions may also be sent to local American Red Cross chapters or to the American Red Cross, P.O. Box 37243, Washington, DC 20013. The American Red Cross Northern Minnesota Region is pleased to present our 2012 Heroes Awards recipients. This year’s honorees include a teenage boy who performed life-saving CPR on his sister, police officers who rescued people from a burning building, and a soldier who stayed in the line of gun fire so that his teammates could seek safety. Click on each image to see each hero’s story. American Red Cross Heroes are honored for demonstrating the Red Cross mission to prevent and alleviate human suffering in the face of emergencies. You can support this mission by becoming a Red Cross volunteer, giving financial contributions, or donating blood. 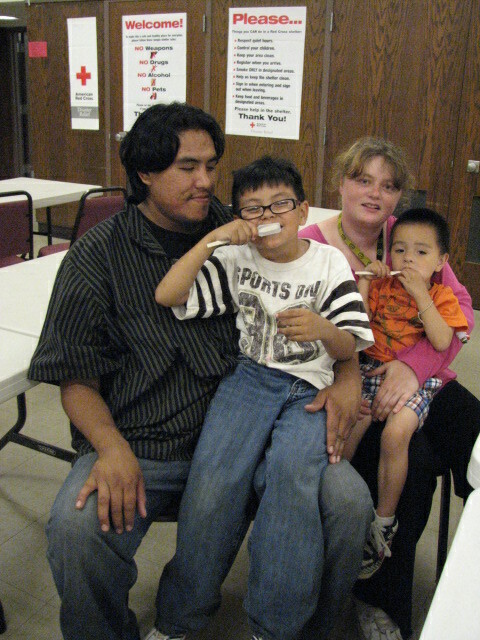 Learn more on redcrossmn.org. 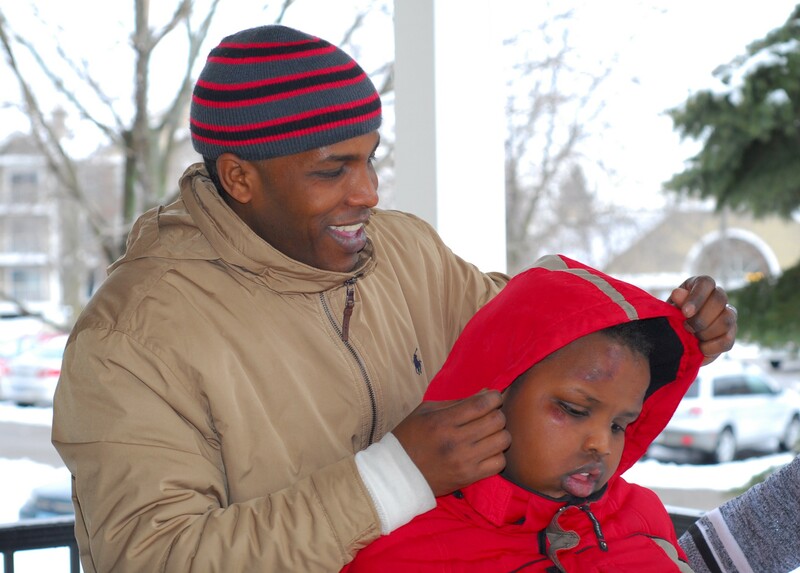 Abdiaziz Warsame has lived in Minneapolis for the past six years taking care of his son and anticipating a life without his wife, his son’s mother. That was until he reached out to the Red Cross and its family tracing services. Abducted by militia in Mogadishu, Somalia, there was little reason for Warsame to believe that his wife was anything but dead. He fled with his son to Cairo, Egypt, where he sought refuge with the United Nations. His son’s condition, which includes brain damage and some paralysis, prompted a quick departure for an operation in the United States. “I will not forget how the Red Cross helped me find my wife and how the Americans have been good to us,” says Warsame. The Red Cross sent a message from Minneapolis to Washington D.C., to Geneva, Switzerland, and then to the Red Cross in Nairobi, Kenya. From there, the Somali Red Crescent conducted a field search and found Warsame’s wife, Ayan Mohamed, in Mogadishu. 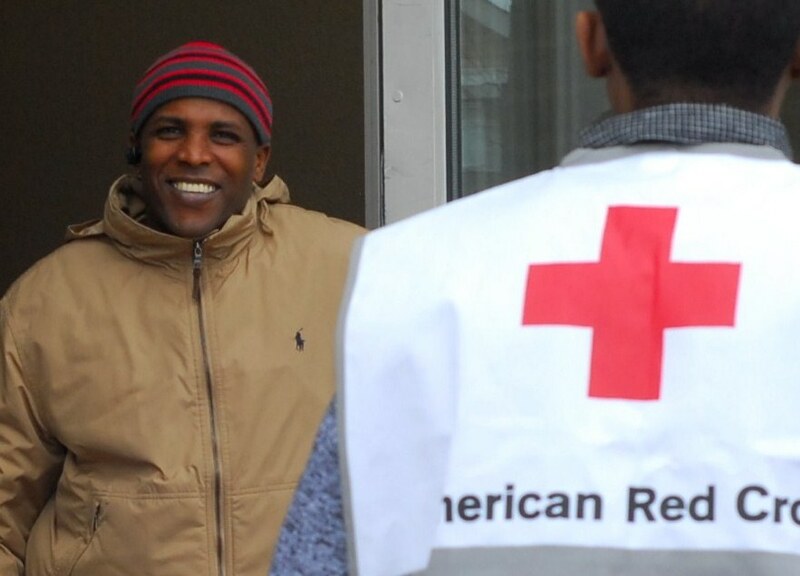 They returned a message in the opposite direction that the Red Cross delivered to Warsame in Minneapolis. The message came with a phone card, which Warsame immediately used to call his wife who had no idea her husband was living in America. Now, Warsame talks on the phone with his wife every day. Little things do matter. 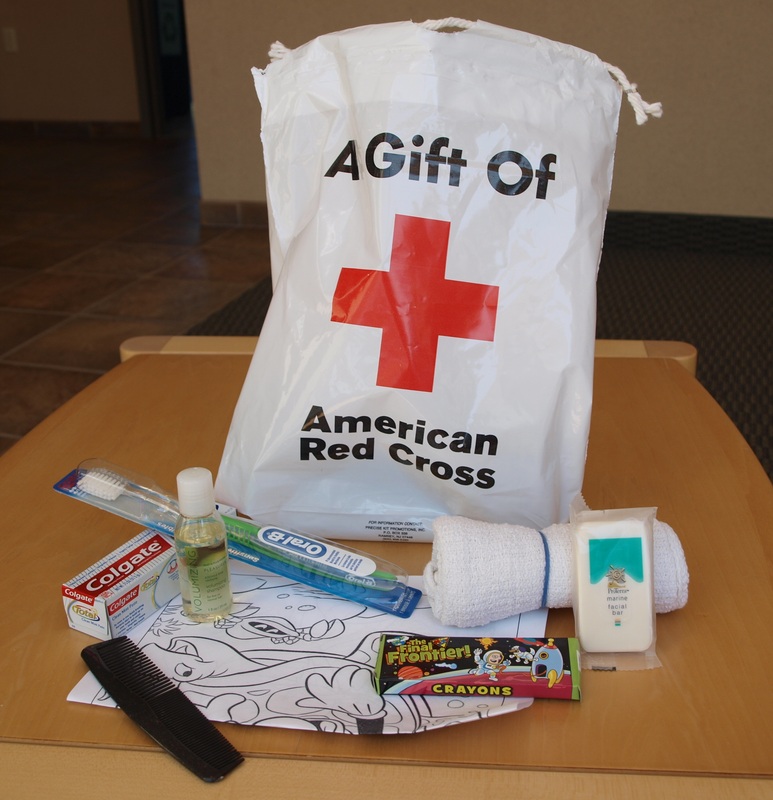 Take a Red Cross comfort kit. It consists of shampoo, toothbrush, washcloth, and other toiletry essentials. These are small things that add up to big comfort after disaster. 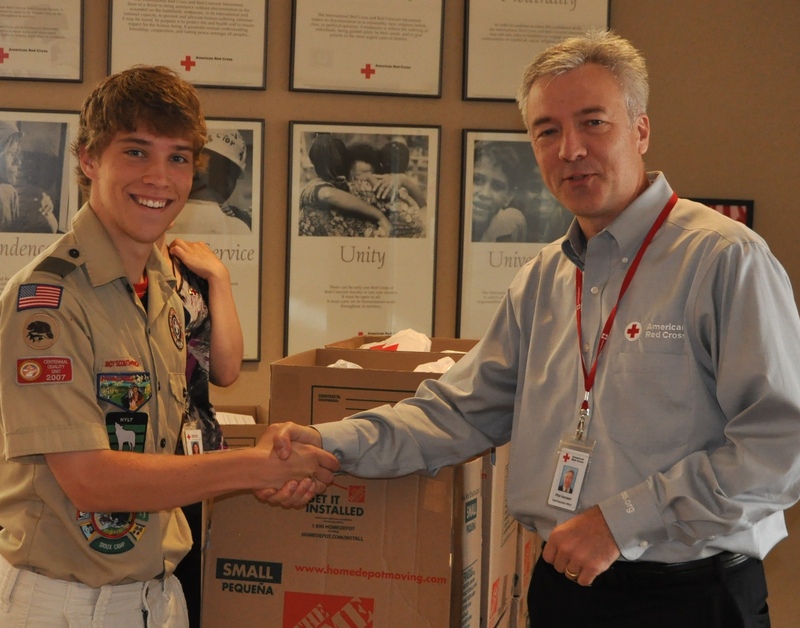 Recently, Minneapolis-based Wells Fargo employees helped make more than 300 comfort kits that Red Cross volunteers will give to families affected by home fires, flooding, and other disasters. Helping out like this is a darn cool thing to do for your community. Thank you, Wells Fargo, for stuffing a bit of comfort for when people need it the most. Others can help too by shopping the 2011 Red Cross Holiday Giving Catalog.